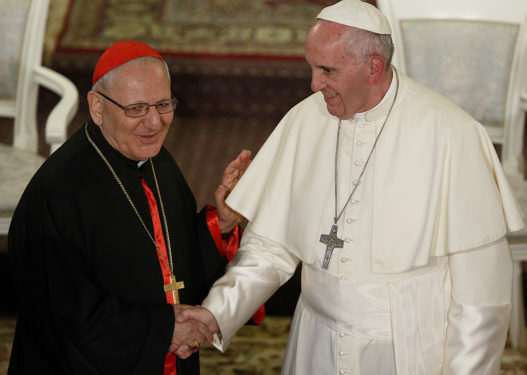 ROME (Crux) – According to the head of the Iraq-based Chaldean Catholic Church, the United States government has done nothing to aid Christians in Iraq. “Why are there 3.5 million Iraqis outside of their homes? Who will restore Iraq’s normality? This is a big political responsibility. The policy is not only looking for political interests but also to respect human beings,” Cardinal Sako told reporters at an encounter on the sidelines of the Oct. 3-28 Synod of Bishops on Young People, the Faith and Vocational Discernment. Cardinal Peter Turkson of Ghana was also present at the press conference, and was quick to make a clarification regarding U.S. aid for the reconstruction of Christian villages in Syria and Iraq. He said, “even though there’s been no help from the government,” there’s been a lot of money coming in the form of organizations related to the U.S. Church and also from ordinary citizens. Speaking about the synod experience – this is his fourth – Cardinal Sako says he’s learned a lot and that he believes the presence of 35 young people in the meeting has enriched the experience, although he says there were not nearly enough youth represented. He also wants the Church to find a language that is comprehensible to young people, because “we’re used to a traditional language that today doesn’t speak,” he said, noting that he says this as a patriarch of an Eastern Church. “I come from a country that has suffered a lot, and unfortunately in the ‘Instrumentum laboris’ [the document the bishops have been using to kickstart the discussions], we talk a lot about problems, including migrants, but very little about these young persecuted Christians,” Cardinal Sako said, adding that despite this omission, it is being addressed in the small working group discussions the bishops take part in. Faith is strong in the Iraqi community. Praise the Lord.